Leadership Q&A: Luis Urzua: Exception or Standard? Watching the rescue of the 33 Chilean miners was heartening to see. Hearing the description of what the shift boss, Luis Urzua, did to lead the 32 miners was inspiring for one whose has spent most of his adult life focused on leadership. Here is a man who understood that leadership is more than being the boss. It is about creating an environment of high standards, safety, continuity, mutuality and trust. Luiz Urzua, only two months on the job when the cave-in occurred, with calm and determination, organized the men in the mine into a society. They established discipline, an organization of where their latrine would be, how to ration two days food into two weeks nourishment, when day and night would occur, and more than anything a calm in the face of death that united the men so that they could survive emotionally the isolation and hardship of 69 days 2000 feet underground. This is a remarkable story of survival. But not necessarily a remarkable story of leadership. For what Luis Urzua did was what all of us as leaders should be doing. As I have written about leadership as stewardship, I hope that what is conveyed is the importance of people to any enterprise. The care of people creates an environment where they care for the place they work. This is not simple or a matter of implementing some soft skills. This is hard work because people are the product of the environments where they live and have grown. Many come to the work place beaten down by life, others come with a strong sense of entitlement that they deserve more than they deliver, others come looking for their workplace to be a place of therapy and emotional resolution, and then there are those who come ready to learn, grow, engage and produce. Recently, I was talking with a friend about the staff in his office. He is not the senior executive, but a program officer. He told me about a training program conducted in his workplace that would improve the communication, collaboration and coordination of the various offices within their organization. He shared that there were some at the end of the training who remarked that they weren’t up for implementing this new system. He describe one person, as she quickly walked out of the meeting at 5:01 to go home, as brushing it off as something she did not have any interest in doing. There is no single cause for this mindset in the workplace. It is a mindset that would never survive what the 33 Chilean miners experienced. It is unfortunate that it takes a life-and-death event to show what this particular kind of leadership looks like. This is not exceptional leadership. This is leadership. This is the standard that we should all be aiming for. Luis Urzua led in such a way that this little society deep down in the earth didn’t turn tribal, didn’t turn into a survival of the fittest, didn’t turn into a recreation of William Golding’s Lord of the Flies, didn’t turn into what we see in many offices, me against you. Instead, we have a picture of a team unified, disciplined and emotionally intact as individuals and as a team after 69 days underground. What does it take to be a steward like Luis Urzua? We have to care for people, as individuals and as a team. Part of this caring is leading them out of their own self-centered independence into a collaborative environment of mutuality and interdependence. We can’t simple say here are your performance standards, meet them. We have to recognize that the majority of the people whom we work with are measuring their involvement in the office by their own individual standards, not anyone else’s. There are many reasons for this. One being the lack of the kind of leadership we see in Luis Urzua. Our caring for people has to result in their caring for one another. If the Chilean miners had functioned like many offices, they would not have survived. It doesn’t require a life-and-death scenario for teams to function as a society whose care for one another elevates the performance of the organization. The miners cared for one another and were willing to lay aside their own personal desires for the good of the team. I’m convinced that this is not a natural response, but one that is a product of effective leadership. We need standards, fair expectations for the attitudes and behaviors of the responsibilities that we each have toward the team and the organization, and we have to produce. This kind of leadership breeds a team that is both confident and competent. 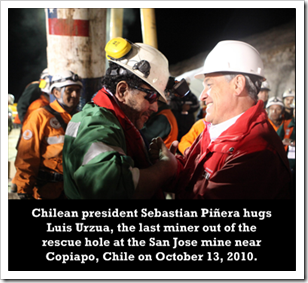 We need to learn from the experience of the Chilean miners. Celebrate their rescue. Celebrate the dignity, commitment, and warmth of the Chilean people. Celebrate the example of Luis Urzua as leader and steward of his men. Celebrate the possibility that each office, each division, each company and each community can model this same kind of community of leaders and stewards. Luis Urzua is not the exception; he is the standard for us to follow. Photo credit: HUGO INFANTE/GOVERNMENT OF CHILE *** NO SALES. EDITORIAL USE ONLY. Leadership Q&A: How Can I Become A Better Leader in 2011? Tagged with calm, caring, cave-in, Chile, Chilean, collaboration, communication, competence, confidence, coordination, discipline, emotional, Golding, leadership, Lord of the Flies, Luis Urzua, miners, organization, people, President, Sebastian Piñera, standards, steward, stewardship, survival, survival of the fittest, tribal, unity, William.